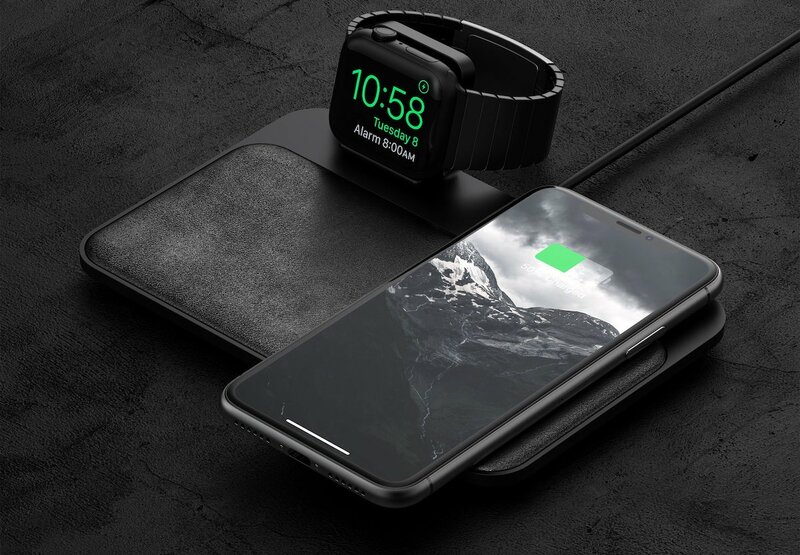 Accessory company Nomad today launched the Base Station Apple Watch Edition, which includes a Qi charging mat for iPhone and integrated charging puck for Apple Watch. The new accessory is an upgrade from the original Base Station, which was focused on Qi charging for iPhone and lacked Apple Watch charging support. The Base Station Apple Watch Edition includes three 7.5W charging coils underneath a padded leather surface, which the company says will let users choose from multiple charging orientations. On the top left corner of the unit is a stand for Apple Watch, which charges the smartwatch in Nightstand Mode and supports both closed loop and open loop bands. Nomad says the Base Station Apple Watch Edition can charge up to three devices at once, presumably referring to two Qi-compatible iPhones and one Apple Watch, but it's unclear how a second iPhone fits on the mat when Apple Watch is charging. Nomad seems to acknowledge this in its FAQ on the stand, stating that while it supports up to three devices, "it is designed to comfortably charge 1 Apple Watch and 1 phone simultaneously." Easily charge your Apple Watch and iPhone wirelessly. We've added three coils to provide mulitiple charging orientations; center your phone over a coil and wirelessly charge your phone how you like. Great for your desk, bedside, and around the house. We recently got our hands on the original Nomad Base Station and shared our thoughts in a review on the MacRumors YouTube channel. While the leather surface lacked reliable grip for case-less iPhones and finding the hot spot for charging proved finicky, we largely came away impressed by Nomad's accessory thanks to its design and additional port options on the back. In terms of those ports, it's worth noting the updated Base Station Apple Watch Edition appears to have ditched the extra USB-A and USB-C ports on the back of the device. For those interested, the new accessory is available to purchase on Nomad's website today for $119.95. Note: MacRumors is an affiliate partner with Nomad. When you click a link and make a purchase, we may receive a small payment, which helps us keep the site running. That looks fantastic. Except for the chunk of dead animal on it. I would rather it had micro fiber or something. Not for moral reasons per se, but leather does seem unnecessary for something like this. Instead of laughing, try being considerate of other people’s positions and opinions, even if you may not personally agree with them. I would buy this today if Apple would release the wireless charging case for the AirPods, or even better—new AirPods that already have that case. That little container would fit nicely in front of the Watch and look tidy and organized, especially if Apple would release black AirPods. Otherwise this is a really awkward design for charging two iPhones and a Watch. I also don’t understand how unknown brands on Amazon are selling things like this for $30. The answer to your quandary is in your statement.